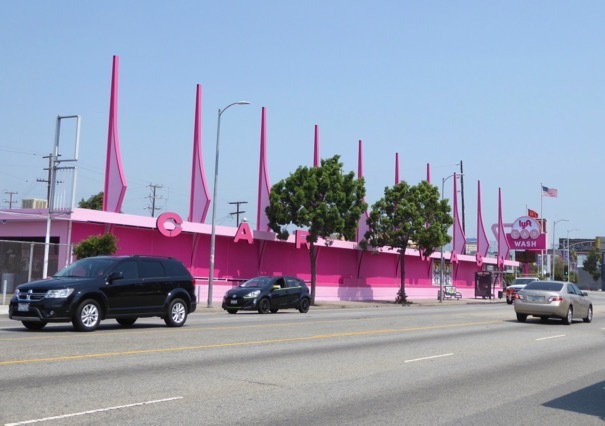 Compared with living in London or New York City, hailing a cab in Los Angeles has always been that much harder. 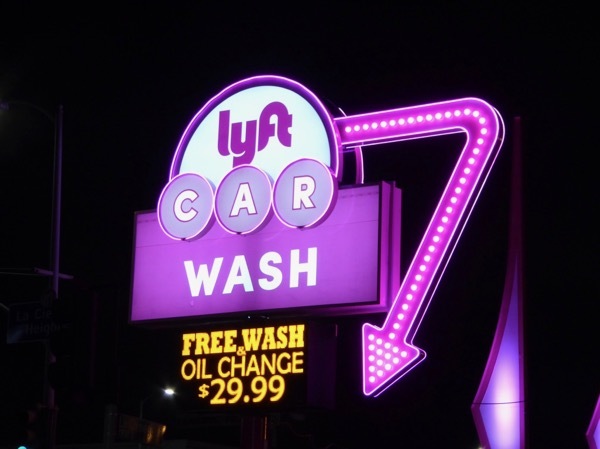 That's probably why when ride-sharing services like Lyft and Uber launched, passengers were more than willing to hop on board (that and the fact that the cars were in a nicer condition, the drivers were friendlier and they probably knew where they were going compared to taxis). Initially when the on-demand ride-sharing app Lyft launched everyone wondered what all the fluffy pink mustaches on the front of cars were for, but now the service is established they seem to have faded from use and you certainly don't hear so much about it compared to its rival Uber these days. 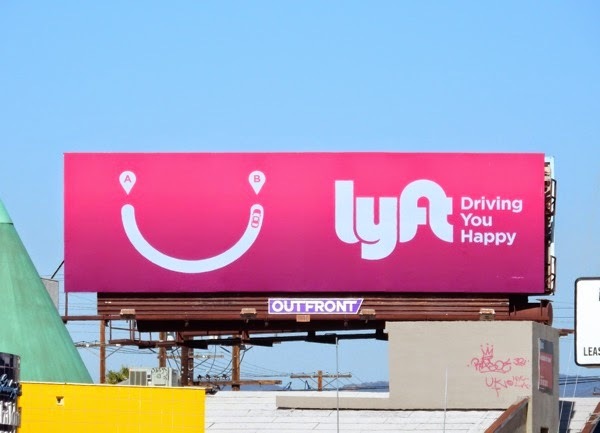 That's probably why the app car service has used their outdoor ads to raise its profile again with these hot pink billboards that really stand out. 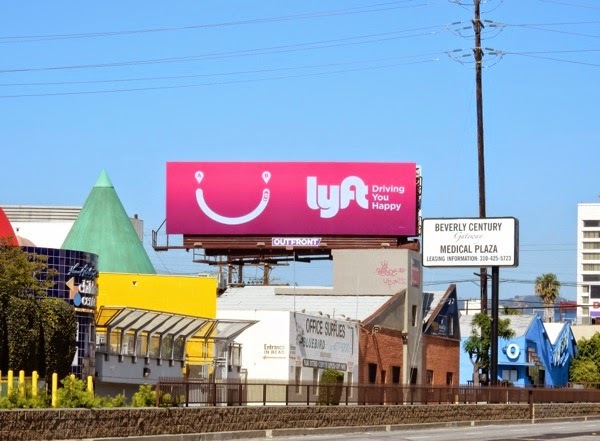 The 'A to B smile' version was first spied along Sepulveda Boulevard on March 8, whilst the 'love traffic jams' ad creative was spotted along Pico Boulevard on May 2, 2015. 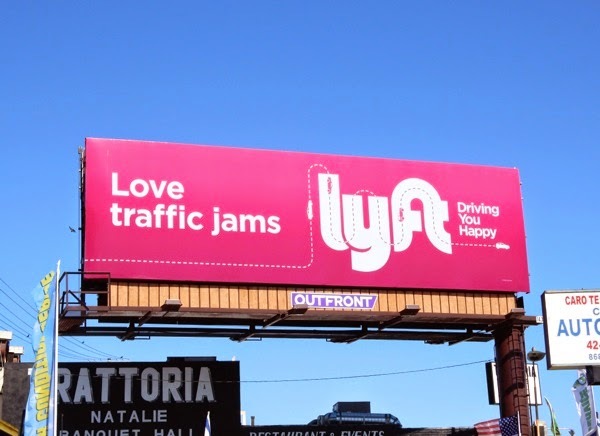 Will they be enough to encourage you to let them drive you happy, especially this holiday weekend? 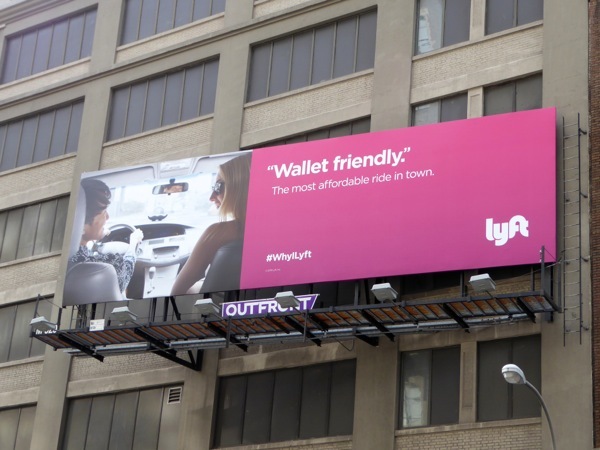 UPDATED: Here's also a collection of billboards for Lyft spied around Times Square and the streets of New York City from October 31 to November 3, 2015. 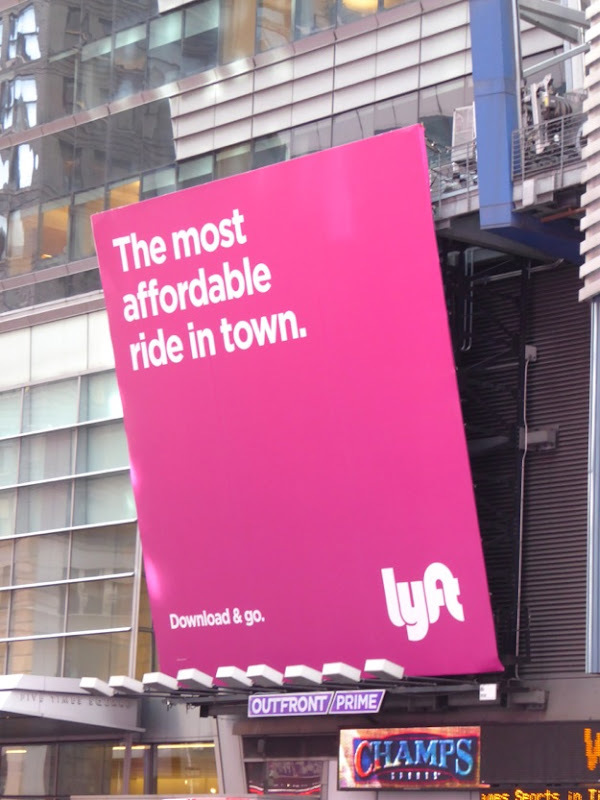 The ride-sharing app is spending big to get its message across in the Big Apple and these outdoor ads certainly stand out with their simple messages and bold pink design. 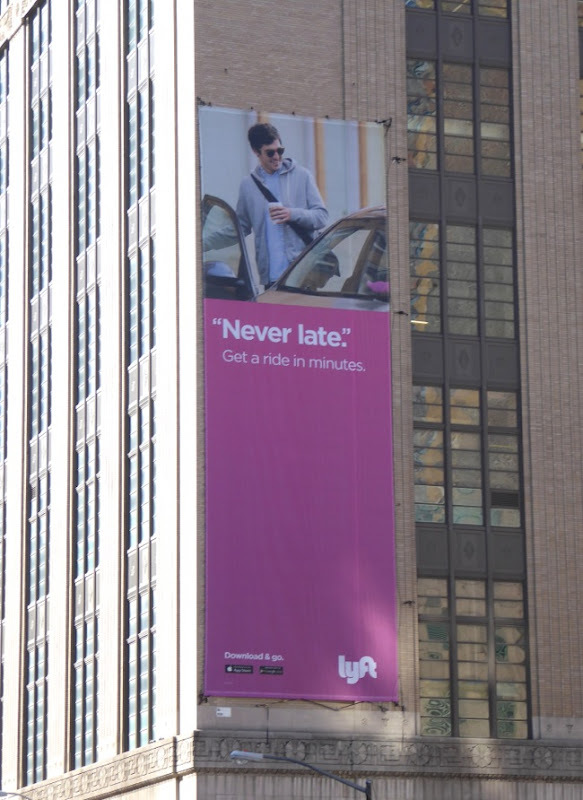 It's no wonder that New York's traditional yellow taxi cabs see the 'download & go' app as such a threat. 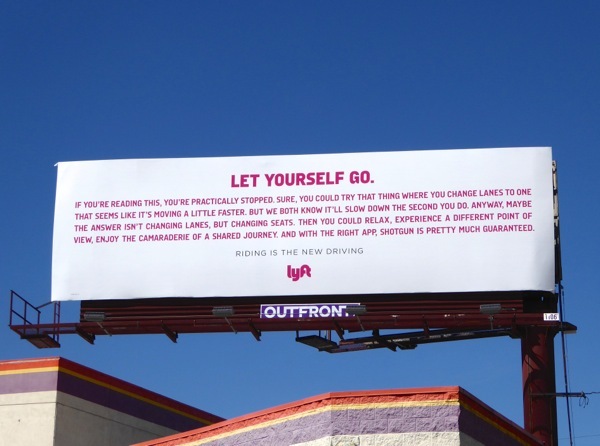 UPDATED: Here's also two examples from Lyft's new 'Riding is the new riding' outdoor ad campaign. 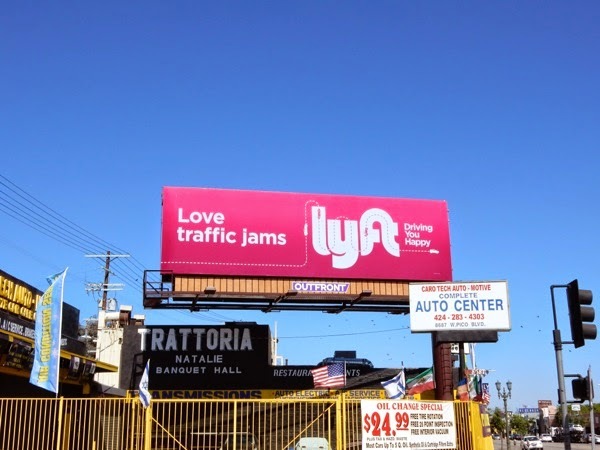 These copy-only billboards want you to give up your own car for the ease of taking a Lyft ride and were snapped along L.A.'s Santa Monica Boulevard, one eastbound and one westbound, on February 25 and March 22, 2016, respectively. 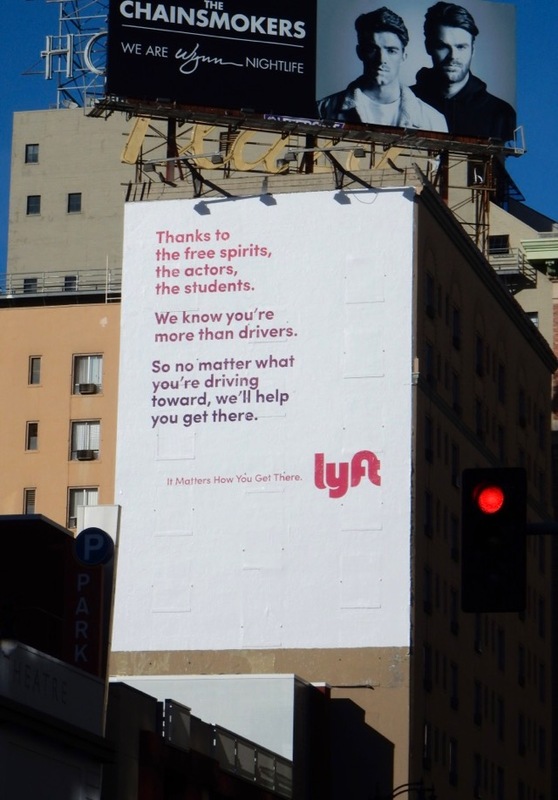 The sentiment is a nice idea and the amount of copy certainly makes you want to see what it is from a distance, but unless you are directly under the ads themselves, it's impossible to see what they say unless you have super-vision. 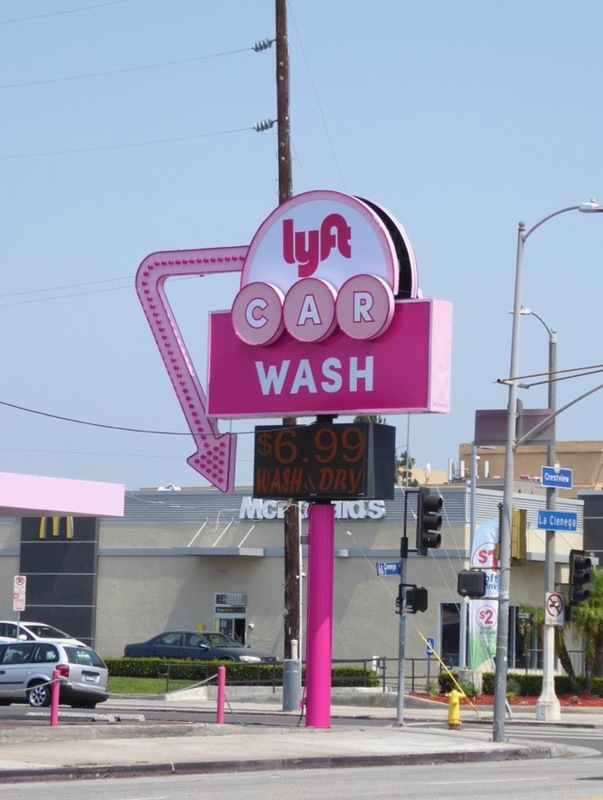 UPDATED: Lyft is back in Los Angeles a big way in summer 2017 by taking over this classic car wash along La Cienega Boulevard, painting it pink and pimping it out with a fun retro-look neon sign. 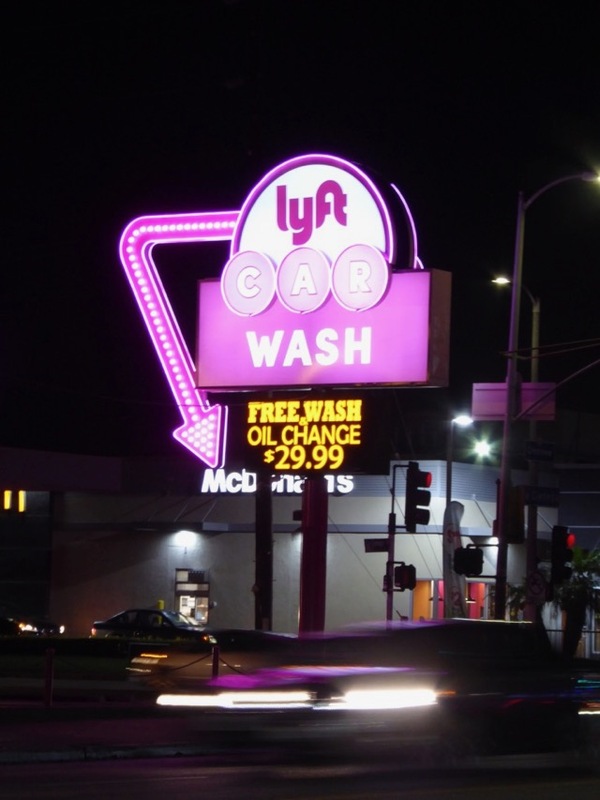 This temporary takeover was photographed along La Cienega Boulevard at Sawyer Street on July 12, 2017, and the Lyft retro car wash sign was created with the help of Atomic Props & Effects using LED bulbs and LED neon. 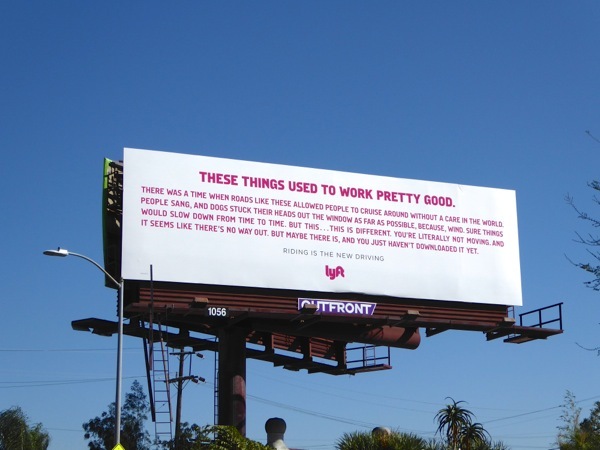 This is certainly a fun, eye-catching PR stunt for the ride-sharing app that looks pretty in pink. UPDATED: Aside from helping out its drivers with discounted car washes, Lyft is back in the holiday skies thanking all its drivers, whether they are actors or students, with this giant billboard snapped above Hollywood's Vine Street on December 7, 2017.